Ms. Bhuchar has over fifteen years of experience in immigration law and over ten years of experience in family law. She was a former partner at Kumar Pathak, LLC and managed the firm’s immigration law practice, with an emphasis on corporate immigration. Earlier, Ms. Bhuchar worked for Merrill Cohen and Associates, a New York City Immigration Law firm, where she gained experience in complex corporate immigration cases with Fortune 500 and multi-national companies. She has been entrusted as immigration counsel for many global IT companies and other businesses. Ms. Bhuchar has conducted seminars for corporate clientele and various board members on immigration law. She is a member of the AILA. 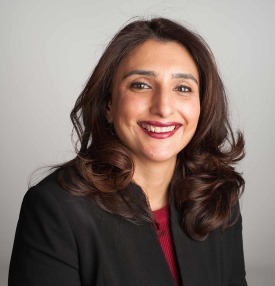 Ms. Bhuchar also manages the firm’s family law practice, including issues such as no-fault and fault divorce, separation and settlement agreements, pre- and post-nuptial agreements, alimony, child support and custody, termination of parental rights, adoption, Pendente Lite applications and post-divorce issues. Ms. Bhuchar is a trained mediator and can mediate divorces in New Jersey. Every client is an important client for the firm. This was validated for the firm by the receipt of the “New Jersey Excellence Award presented to Bhuchar Law for Excellence in Legal Services” in 2015 by USCTRI. Ms. Bhuchar is an active member of the South Asian and legal communities in New Jersey (see Professional Associations and Memberships, below). She has a strong community base. Ms. Bhuchar has been a Co Host on EBC radio for almost two years discussing South Asian Community issues. She volunteers as legal counsel for the women’s organization Manavi. Ms. Bhuchar also previously served as legal counsel for the Dushahra Committee.